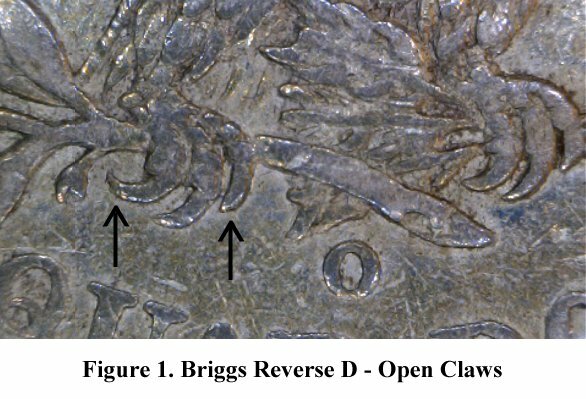 Open and closed claw reverses of the 1838 and 1839 quarters are relatively well known and collected by a fair number of people. Even the 1840 transitional versus new hub reverse, with the distinct eagle’s claws, has gained some recognition. However, some of the “transitional” (i.e. open claws) reverses that show up later in the series are still almost entirely unknown to collectors who have not studied reference materials in detail. These occasional, short-lived design changes appear to be unique to the quarter series (there are no analogous changes to half dollar reverses) and are most easily identified by the eagle’s claws. This month’s quarter is the 1842-O with transitional reverse (Briggs reverse D – only known paired with Obverse 3). The difference in claw configuration is quite obvious as shown in Figure 1 (Briggs’ reverse A with closed claws) versus Figure 2 (Briggs’ reverse D with open claws). Note that both left and right claws are notably more open on the transitional reverse. 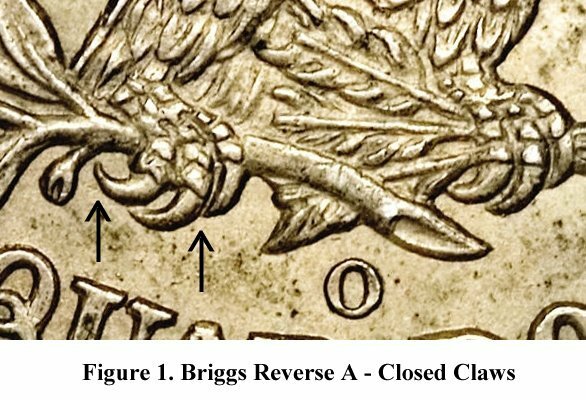 The open claw, transitional reverse has been an elusive variety to locate; in fact, study of 69 1842-O Large Date quarters pictured in the Heritage archive indicates that only 2 of those 69 have the transitional, open claw reverse. Further, both of those coins were sold in “details” (i.e. problem) holders. The variety is clearly quite rare, particularly in original and problem free condition.